Jul 04, 2018 Iulius E. S.
This is Al Pacino at the height of his angry, commanding performances and he utterly wrecks what could have been a pretty sappy and average legal drama otherwise. Supported by strong performances from a young Jeffrey Tambor and Craig T. Nelson, And Justice for All starts a bit meandering, but quickly ramps up to an escalating conclusion, which culminates in Pacino's famous courtroom diatribe. lol - a satirical drama, not devoid of laughs, that left a unique, poignant, and satisfying aftertaste. Oh and great acting, of course, including some quintessential Pacino screaming. Great movie and one of few that gave me nightmares. So sad to get to see (and not only to know somehow) that lawyers really have forgotten that we are people and not just money machines. Thank god it showed also that there are some left that do it for the right reasons! 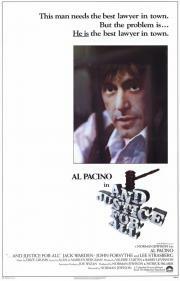 Gee, one of the hardest jobs in the world being a defens lawyer Great acting and story, I enjoyed it a lot!